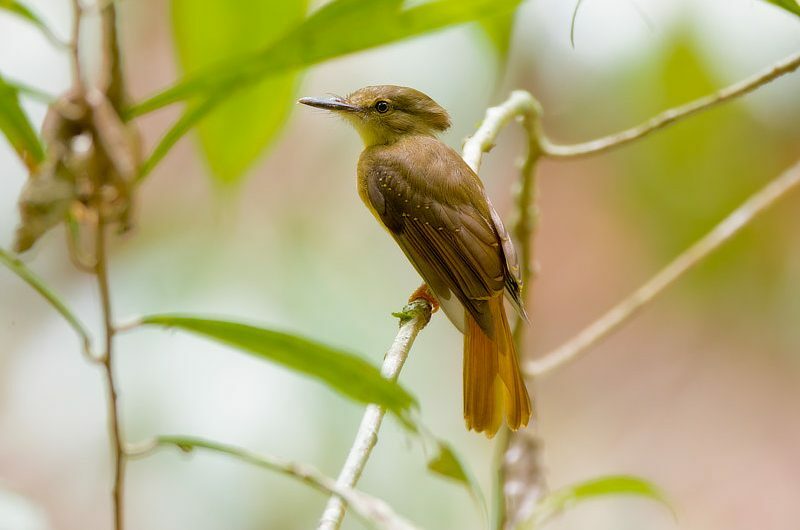 This well-named, medium-sized forest flycatcher is a most-wanted bird on many of our guests’ lists! It is known for its spectacular long, fanned, red and blue crest, which is almost always held down, giving the Royal Flycatcher a distinct hammerhead appearance. It is brown overall with a bright buffy, long tail, and has small buff spots on the wings. It has a long bill with conspicuous rictal bristles. With its big size and unusual crest, the Royal Flycatcher is an unmistakable bird. The Royal Flycatcher is inconspicuous and usually solitary, and can be found in the forest understory, often near streams. It can also be found in mature secondary growth and forest edges. It does not join mixed feeding flocks. It is overall relatively quiet, but occasionally announces its presence by giving an abrupt, sharp and clear two-note call, kwee-up! Its song is a series of high, sharp notes, often followed by a series of descending whistles. It forages in the understory of the forest for ticks, leafhoppers, small cicadas, butterflies, dragonflies and grasshoppers, capturing its prey by sallying flights from a perch. It perches upright with its tail vertical, and spends more time perched and visually searching for prey than sallying out to catch insects. The Royal Flycatcher is best known for its incredibly ornate crest, which is rarely seen under natural conditions. When it displays, it raises and extends its crest, fanning it laterally, and rhythmically and slowly twists its head from side to side, opening and closing its bill. This is most often seen in the hand in mist net captures, but has been observed in the wild when preening, in courtship displays, after mating and as a territorial display. Both males and females have the elaborate crest, but it is paler in females. Its nest is a very long (60-180 cm in length), slender, pendular nest with a side entrance, built low over a shady stream. The nest is made from plant fibers, epiphytes, dead leaves, rootlets and green moss. The female lays two reddish-brown eggs and incubates them for a period of 22-23 days. The female is responsible for parental care, from brooding to feeding. The Royal Flycatcher ranges from southern Mexico to northern Bolivia and southeastern Brazil. There are 4 subspecies – Northern (found in Central America), Pacific (Pacific coast of Ecuador and Peru), Amazonian and Atlantic (Atlantic forest of Brazil). The Royal Flycatcher is uncommon but widespread in Panama in the lowlands and foothills to 1100 m, and can be found around the Canopy Tower and Canopy Camp Darien.